When it comes to startups, they may not have the upper hand in choosing the best places for their office space. Limited resources also mean limited place to work on. But just because startups include fewer boundaries doesn’t mean an office space has to be made to look like a warehouse. Rupesh Krishna Shrestha, the assistant professor at Kathmandu University School of Management(KUSOM) and a coordinator of Idea Studio shares the story behind creating the incubation center’s work space and what startups can learn from it. Idea Studio, which is a joint effort by UNICEF, KUSOM, Child Reach Nepal and Meeting Point has collected 35 ideas from around the country to mentor and develop them into promising companies. But for the people behind it, starting something new was not limited to the concept of the program. They wanted to create a studio that was equally inspiring for the participants, a place where the participants and their ideas could grow. “We couldn’t be boxing people inside cabinets. 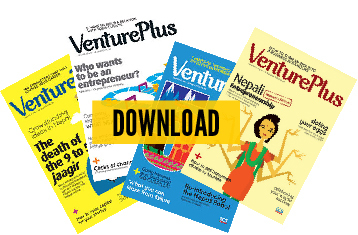 Especially when the whole thing is about letting ideas happen,” says Rupesh Krishna Shrestha, who was also involved in creating the work space from the start. The studio is bright, colorful and spacious not to mention welcoming. It has two meeting rooms, a business deal room in the corner, and also a large space filled with portable furniture, which can also provide space for group activities. This also means the settings in the studio are always changing. Kripa Shakya of Fine Designs took inspiration from famous office spaces like that of Apple and Google to create the studio. While most startups may not be able to get large spacious areas for their offices, here are some tips one can learn from Idea Studio’s work space that will help to bring out the best in even the most limited spaces available. In a crammed space, vertical spaces rule. Walls can be installed with shelves which will decrease the clutters on desks such as speakers, books and files. Cabinets can be used to define partitions while also fulfilling its original purpose. “The cabinets in the studio work as a partition between the creative space and the office space. But when required, such as during presentations and group sessions, we move the cabinet to create a larger area.” says Shrestha. Usually in a startup, there are no designated hierarchies and this creates a work area that is less rigid. Hence, it is easier to work in the same area with a lot of people. “We have a lot of open space that allows people to interact and come up with new ideas in the Idea Studio. This continuous communication results in exchange of ideas and as I’ve observed, has helped different ideas to even collaborate,” says Shrestha. An open and lively space is obviously a necessity but it is as important to create a separate meeting room. “There should obviously be a place where business transactions can take place. It should speak out professionalism and practicality. Adding a few pieces of art makes it better.” says Shrestha, “Our business deal room has wi-fi connections and all the necessary gadgets available for efficiency.” The business deal room is isolated from rest of the studio making it great for personal interactions. As a startup, you want to bring in as many business deals as possible and that is a great opportunity to show off your workspace. 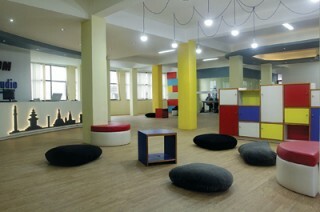 “An office space should be creative but at the same time welcoming. The interior should not overwhelm the visitors.” states Rupesh Krishna Shrestha. While designing Idea Studio’s interior, architect Kripa Shakya did a lot of research on how big tech companies played with their office spaces. Taking inspiration from these spaces, she tried to create a space which doesn’t dull the participants’ creativity. “Any space which is not fun to work at will not bring positive results, especially spaces working with designing and ideas.” says Kripa. With this idea the team has included a lot of interesting elements, such as a mini library, portable box cabinets and even a table that can be divided into 14 pieces and is shaped like the map of Nepal. what not to do on your website?